Eric Schneiderman has been a tireless advocate for the rights of LGBT New Yorkers and our families and we couldn't be more thrilled to endorse his candidacy for attorney general today. During his tenure in the State Senate, he has always been there for us, going above and beyond voting for our rights: advocating for us in his district, marshalling pro-LGBT votes from his colleagues and leading floor debates on marriage equality. He is exactly what we need in a statewide elected official. 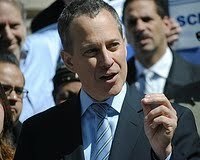 Eric Schneiderman voted to pass the Hate Crimes Bill and the Sexual Orientation Non-Discrimination Act (SONDA). As a lead sponsor of the Dignity for All Students Act, which passed the Senate on June 22 with a bipartisan 58-3 vote, Schneiderman helped create legal protections for public school students from harassment and bullying, marking the first time that protections based on gender identity and expression would be included in state law. He is a cosponsor of the Gender Expression Non-Discrimination Act (GENDA), which would ensure that all transgender New Yorkers are free from discrimination. At the Pride Agenda, we know it takes more than passing laws to secure equality and justice for LGBT New Yorkers and our families. We need an attorney general we can rely on to make sure those laws are carried out and that statewide policies and standards are in place to protect the entire state, including LGBT people. Schneiderman is that candidate. From fighting for marriage equality to ending bullying in schools to cracking down on big pharmaceutical corporations that are cheating New Yorkers with HIV/AIDS, Schneiderman will be an attorney general who never backs down in the pursuit of justice. He has promised to vigorously enforce every statute that protects the rights of the LGBT community and be a steadfast ally every step of the way. Please get involved in the campaign to elect this reliable and visionary leader. Invest in New York's future and make a donation to our PAC or sign up to volunteer on this critical race.